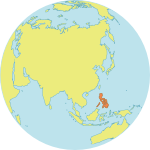 ILIGAN, Philippines – Nineteen-year-old Tarhata Mostare gave birth to her third child at home on 23 May – the same day fighting erupted between government forces and the Maute and Abu Sayyaf armed groups in the city of Marawi, on the long-embattled island of Mindanao. The violence quickly escalated, and a state of martial law was declared. Three days after giving birth, Ms. Mostare fled with her family, making the harrowing journey to an evacuation centre in the neighbouring city of Iligan. She travelled much of the way on foot. Despite the hardship, she knows things could have been much worse. Some 385,000 people have been displaced, according to 28 June information from the government’s disaster response centre. The crisis has increased risks for women and girls. Those living in crowded evacuation centres, for instance, often lack privacy and protection from gender-based violence. Approximately 11,500 of the affected women are estimated to be pregnant, and over 7,000 gave birth in the last six months. These women require prenatal and post-partum health care, as well as help maintaining proper hygiene and nutrition. Worryingly, interviews in evacuation centres have revealed that most pregnant women did not receive prenatal care before being displaced, and a significant number of pregnancies are among teenagers. Together, these factors reflect high levels of vulnerability among the crisis-affected population. “It has been challenging,” said midwife Mitzie Belasio, 45, who was deployed by the local health office to monitor the health of pregnant women, new mothers and children at the Maria Cristina evacuation centre in Iligan City. UNFPA is responding to the situation by distributing hygiene supplies and health materials, and is preparing to establish women-friendly safe spaces, which offer protection and care to women at risk of gender-based violence. Ms. Belasio has been stationed at the centre since May 26, but language barriers are a problem, she explained. “Many of the evacuees do not understand us, and we don’t understand them,” she said. “As providers, we have to continuously have patience as we counsel and make them feel that we are there to help." 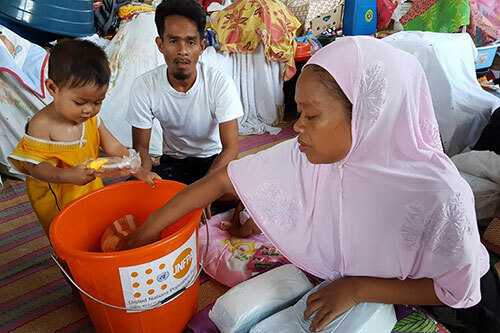 With support from Australia, UNFPA is distributing 5,000 dignity kits for pregnant women and new mothers. These kits contain hygiene materials such as sanitary napkins, underwear, soap and shampoo, as well as items to help women feel safe traveling in the dark, such as flashlights and whistles. UNFPA also distributed 1,200 clean delivery kits to midwives and health workers. These kits contain sterile supplies to facilitate safe childbirth, such as razors, plastic sheeting and other essential items. Yet as the conflict grinds on, there is growing uncertainty over the futures of those affected. “We hope the fighting ends soon,” said Maria Gina Cabanlit, 53, a member of the Women Welfare Program at the Maria Cristina evacuation centre. “In the beginning we received a lot of donations at the evacuation centre, but as time passed this has declined,” she added.